The Game Boy Player is an accessory for the Nintendo GameCube. As the name implies, it can be used for playing Game Boy, Game Boy Color and Game Boy Advance games. It also has a link port for linking up to other Game Boy systems and accessories. It is the successor to the Super Game Boy. In most regions, black Game Boy Players were shipped far more than any other color, such as indigo and platinum colors that the GameCube itself had. In Japan, a variety of colors for the Game Boy Player have been released much more evenly. The Game Boy Player hooks up to the GameCube by being inserted underneath it. 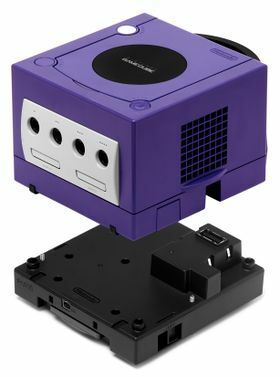 It comes with a special start-up disc which must be inserted into the GameCube before any Game Boy games can be played. 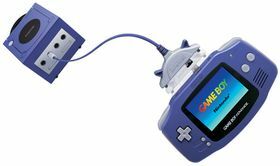 Players may play with a standard GameCube controller, or use a Game Boy Advance that is hooked up to the GameCube with a link cable. By pressing the on the GameCube controller, an options menu appears, but the game does not stop. The Game Boy Player allows for a small amount of customization for playing Game Boy Games. Because the dimensions of a Game Boy screen does not match up with most television screens, a border is necessary. It is possible to configure the size of the border, the background of which can be changed to to a number of different patterns. A timer can also be implemented. Certain titles have a rumble feature that can only be triggered by playing the game with a standard GameCube controller. This is similar to how the Super Game Boy can bring out certain features of certain Game Boy and a Game Boy Color games that cannot otherwise be used. The Game Boy Player, however, cannot bring out Super Game Boy features at all. There are a few titles that are hard to play on the Game Boy Player, such as WarioWare: Twisted! and Yoshi Topsy-Turvy, because they require the player to rotate the entire system around due to the motion sensors on the cartridge, something that the GameCube wasn't designed to do. The games still boot and run normally, however. The Game Boy Player blocks play of any Game Boy Advance Video. A few games (such as Super Mario Advance 4: Super Mario Bros. 3 and Mario & Luigi: Superstar Saga) always display the Game Boy Player logo after it boots up, regardless of whether or not the device is being used. This page was last edited on October 28, 2018, at 02:23.